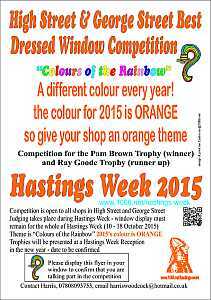 is very pleased to sponsor and print The Hastings Week, programme for 2015. There will be something for everyone and for all ages. Don't miss it! The 949th Anniversary of the Battle of Hastings. 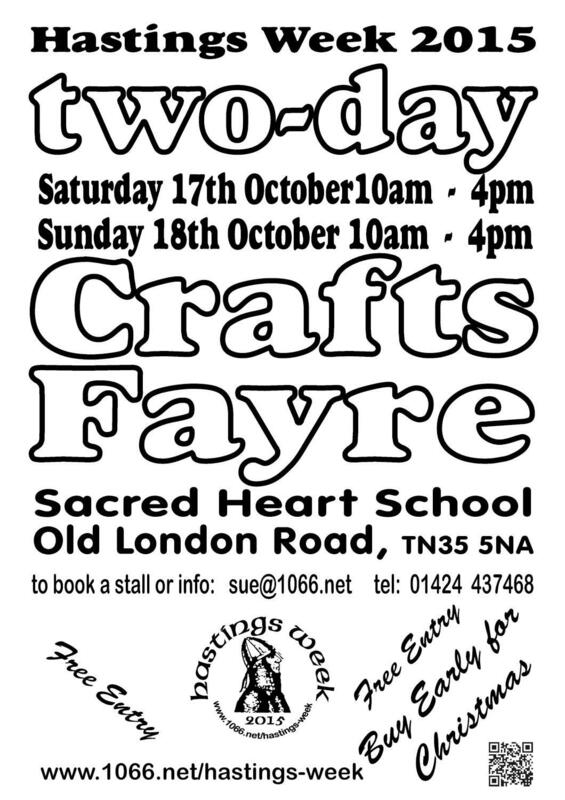 We bring you a festival of Hastings TODAY. Exhibition of a copy of the Bayeux Tapestry and matters 1066, a diorama of the battlefield and Hastings connections with Waterloo, celebrating the 200th anniversary of the Battle of Waterloo. Theme is “Colours of the Rainbow"
Old Town Walks: coordinate the 11am Stade Walk with the 2.30pm Old Town Walk and collect a 10% discount voucher for Eat@TheStade from your Stade guide. No pre-booking - just turn up! Join our volunteer guides for a walk around the Stade, Hastings’ ancient fishing beach area, to explore the history of our unique sustainable fishing community. Walks take about 90 minutes and are FREE but please donate to The Fishermen’s Museum, part of the Old Hastings Preservation Society. Walks are on level but maybe uneven ground, no steps. Suitable footwear advisable. Meet at the Lifeboat Station (blue building on the beach) at 11am. Then at 2.30 pm join us for a tour of Hastings Old Town, the premier ancient Cinque Port, with its wealth of historic buildings, twittens and cat-creeps. Find out why the celebrities of their day flocked to Hastings. Old Hastings Preservation Society volunteer guides lead all walks, which take about 90 minutes and proceed gently downhill, but there are stairs. The walks are FREE, but please donate to the OHPS. Grim and gruesome true tales of terror from Hasting's less illustrious past. Definitely not for the squeamish! Meet at St.Clements Church steps, off High. Street. Duration approx 1 hour 20 mins. Wheelchair aecessable. Dogs on short leads permitted. 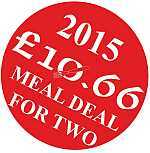 Adult £8.00, accompanied child £5.00, payable on the day, reservations not necessary. Exploring an intriguing labyrinth of alleys and byways, some unfamiliar even to local residents, giving obscured and obscure evidence of bygone Old Town life. Meet at West Hill Lift, George Street. Duration approx 1 hour 40 mins. Adult £7.00 payable on the day, reservations not necessary. Tracing the development of St.Leonards-on-Sea from its inception as a planned new town in the Regency era to the eve of its Victorian expansion. Meet at rear entrance of Royal Victoria Hotel. Duration approx 1 hour 30 mins. Adult £7.00 payable on the day, reservations not necessary. Dare you join us for the biggest and best selection of Hastings true ghost stories vividly told. You will learn of the activities of a variety of phantoms and poltergeists, always strange and sometimes frightening. Meet at St.Clements Church steps, off High Street. Duration approx_l hour .20 mins. Wheelchair aecessable. Dogs on short leads permitted. Adult £8.00, accompanied child £5.00, payable on the day, reservations not necessary. The actual location of the famous battlefield has now been challenged. This illustrated guided walk takes you to the alternative sites, vividly describing the context and the course of the conflict. Meet outside Battle Library, High Street. Duration approx 1 hour 20 mins. Adult £7.00 payable on the day reservations not necessary. Following the early Victorian creation of a second town and the further changes of character of the last century. Meet at front entrance Royal Victoria Hotel. Duration approx 1 hour 30 mins. Adult £7.00 payable on the day, reservations not necessary. Parade forms up facing Town Hall. Speeches from Mayor and Chair of the Hastings Week Committee followed by the raising of the Gonfalon followed by a performance from the Guides & Brownies will perform. 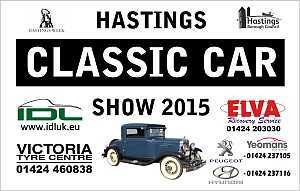 Starting at Hastings Pier and finishing up at the Classic Car Show on the Stade. Setting off from Hastings Pier and dressing up with the children. Favourite characters such as Mickey Mouse, Donald Duck and Elmo will be joining in. 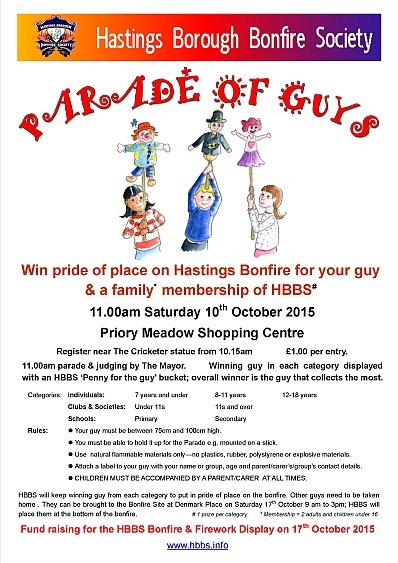 The team from Tiny 1s Day Nursery will be raising as much money as possible to support the Hastings Bonfire Society. Sponsor forms will be handed out. Parade & judging by The Mayor. Winning guy in each category displayed with an HBBS ‘Penny for the guy’ bucket; overall winner is the guy that collects the most. Guided walk by Malcolm Campbell. Grim and gruesome true tales of terror from Hasting's less illustrious past. Definitely not for the squeamish! In celebration of Hastings Week, Mathew Craven & Judith Buckley present 'A hatful of Songs' featuring Flanders & Swan, Noel Coward, Ivor Novello, Gilbert & Sullivan. Guided walk by Malcolm Campbell. Exploring an intriguing labyrinth of alleys and byways, some unfamiliar even to local residents, giving obscured and obscure evidence of bygone Old Town life. Guided walk bt Clive Richardson. A fascinating ‘war time’ guided walk of approx 1 hour, taking in most of the Hastings TV film locations used for this popular TV series. Guided walk by Malcolm Campbell. Tracing the development of St.Leonards-on-Sea from its inception as a planned new town in the Regency era to the eve of its Victorian expansion. Rattlebag Players Present "Napoleon ang the Fishwives". Guided walk by Malcolm Campbell. Dare you join us for the biggest and best selection of Hastingts true ghost stories vividly told. You will learn of the activities of a variety of phantoms and poltergeists, always strange and sometimes frightening. Meet at St.Clements Church steps, off High Street. Duration approx l hour .20 mins. Wheelchair accessable. Dogs on short leads permitted. Adult £8.00, accompanied child £5.00, payable on the day, reservations not necessary. This event is aimed at casual players (those without an official chess grade or with a low grade). 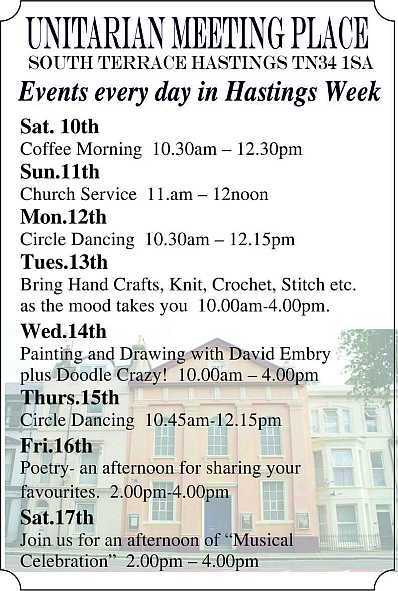 This will be the seventh year that this Hastings Week event has been held and has proved to be very popular. There will be trophies and cash prizes separately for juniors (below the age of 14) and seniors. Entry fee (payable on the night): £5 (£3 for juniors under 14). Tea whilst gazing out across the English Channel. theatricality, so why not find out more with this informa+ve and enjoyable theatre tour. The tour starts at 2pm with Afternoon Tea served at 3pm. Painting and Drawing with David Embry plus Doodle Crazy! 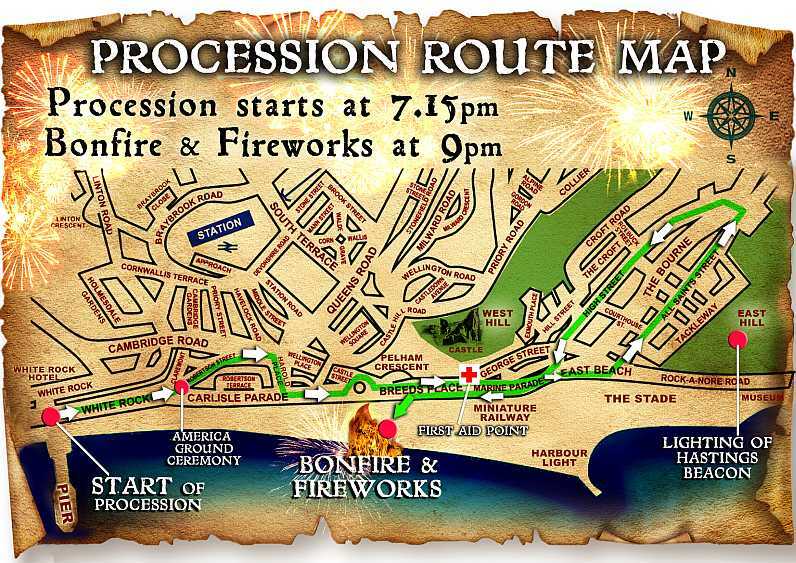 For further information: 01424 461446 / stadewalks@gmail.com - No pre-booking - just turn up! coordinate the 11am Stade Walk with the 2.30pm Old Town Walk and collect a 10% discount voucher for Eat@TheStade from your Stade guide. WHITE ROCK THEATRE Trip the light fantas+c and dance your troubles away at the White Rock Theatre’s Tea Dance. Enjoy an afternoon of dancing along with the White Rock Theatre’s famous High Tea – a brilliant a1ernoon out with friends. Tour of the premier ancient Cinque Port, with its wealth of historic buildings, twittens and cat-creeps. Find out why the celebrities of their day flocked to Hastings. Old Hastings Preservation Society volunteer guides lead all walks, which take about 90 minutes and proceed gently downhill, but there are stairs. 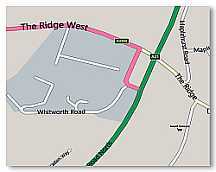 Meet at 2.30pm at the TOP of the West Hill lift. 4) buy on the door. Advance booking advisable as seating is limited. Net proceeds will be donated to local charities, principally St Michael's Hospice. Musical comedy. A singer is looking for love. Her friend isn't much help, and is casting spells behind her back! There is a cat fight or two and a sing-off... It's all lots of fun, set to well-loved Baroque music. 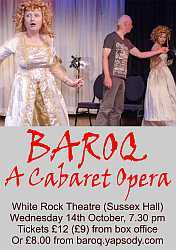 Tickets £12 from box office or £8.00 from baroq.yapsody.com. Emmaus provides a home and work for formerly homeless people in a supportive, family environment. Residents live on site and work together in our charity superstore, collecting and renovating donated goods to sell in order to support themselves. Come along to our open day and take a look around! Browse our superstore and meet residents, trustees & staff over a tea or coffee to learn more about our operation and our future plans. (HRVAB) will be holding their Memories Competition, This year the theme is Entertainment Memories and this is open to Visually Impaired and Normal Vision. 150 to 1000 words, return your entries to HRVAB, by Monday 14th September 2015. Poetry- an afternoon for sharing your favourites. An illustrated talk by David Clarke, the well known author on matters 1066; as well as writing books David is active in planning and organising walking routes exploring our local history. 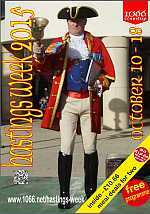 Admission £3 to include refreshments and donation to OHPS and Hastings Week. "Sidney Little - Borough & Water Engineer 1936-1950 - Is well known for his work on many features of Hastings & St Leonards - The Bathing Pool, Twin Deck Promenade & Bottle Alley and Underground Car Parks to name a few. However, little is known of his involvement with the towns post-war Housing Projects. Local Historian and Sidney Little Enthusiast - Andre Palfrey-Martin has researched his involvement, and in particular in the Hollington Council Estates between 1945 to his retirement in 1950, and the legacy that he left for his successor Mr E.O.Baxter." Guided walk by Malcolm Campbell. Dare you join us for tks biggest and best selection of Hastingts true ghost stories vividly told. You will learn of the activities of a variety of phantoms and poltergeists, always strange and sometimes frightening. Downstairs Bar at Ye Olde Pump House, George Street. Join Tina Brown local author and tour producer for the launch of her most recent book on Haunted Hastings. This evening will be a spooky treat, get to meet Tina and the Haunted Experiences team and toast the success of the new book. Tickets, priced £9, include a signed copy of the book, toast drink. Limited numbers, so please book early to avoid disappointment. Tickets available www.hauntedexperiences.eu , at Ye Olde Pump House or by contacting Tina herself, 07817686781. A4 posters can be downloaded here (pdf). Guided walk by Malcolm Campbell. The actual location of the famous battlefield has now been challenged. This illustrated guided walk takes you to the alternative sites, vividly describing the context and the course of the conflict. Safety Notice: Please respect the safety barriers and do not pick up discarded torches or bring your own fireworks and comply with any requests from the marshals. Keep your children with you at all times and ear protection is recommended if you or your children are frightened of loud bangs. Please do not bring pets and dispose of all litter correctly Collections for local charities. Please give generously as all money collected goes to charity. The 3rd Annual Hastings & Rother Charities Fair sponsored by AZUR. FREE ADMISSION TO GENERAL PUBLIC. 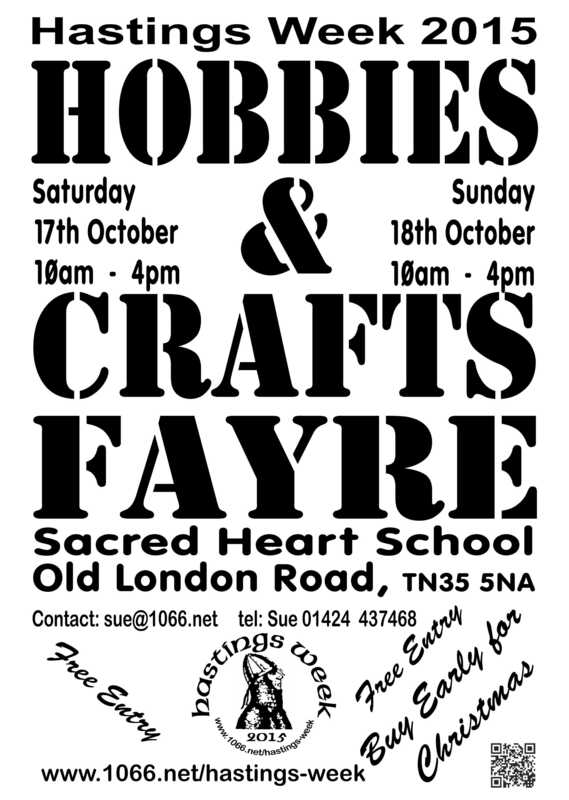 Further details are available from LBM on email lordbrettofhastings@aol.co.uk / 07838241222 / 01424 447461 / 0845 812 1066. 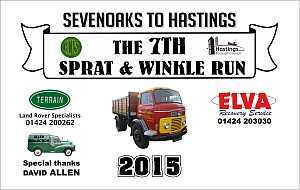 This will be the 7th year that the Sprat and Winkle Run for commercial vehicles has been running from Sevenoaks down to Hastings to bring the Hastings Week celebrations to a close. The run started as an idea by the London & South East Area of the Commercial Vehicle Society who were looking for a seaside destination for one of their old commercial vehicle runs. 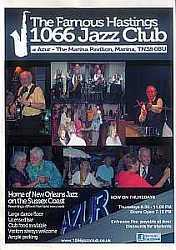 Featuring Herbie Flowers and Mike Hatchard with guests. Tickets £9 from Hastings information Centre. St Mary in the Castle Friends 01424-442601. Guided walk by Malcolm Campbell. Following the early Victorian creation of a second town and the further changes of character of the last century. A fundraising concert at Hastings Museum, John's Place with 'Friends Unlimited'. Tickets £8 [to include tea] available in advance from Helen Bird tel: 01424 752258 or email helen.ladybird@btinternet.com. 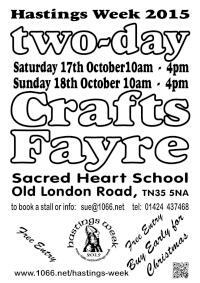 Profit & raffle in aid of Marsham Older People's Project. Marching Units and Mayor's party meet at Stade Open Space at Flag Pole outside Angling Club. Speeches of thanks from Mayor and Chair of Hastings Week Committee and Flag is lowered.